When I was a kid, I remember being selected to play an angel in a Nativity play. Then I got sick, and no matter how determined I was to rock my halo, I was instead relegated to watching it from the sidelines. 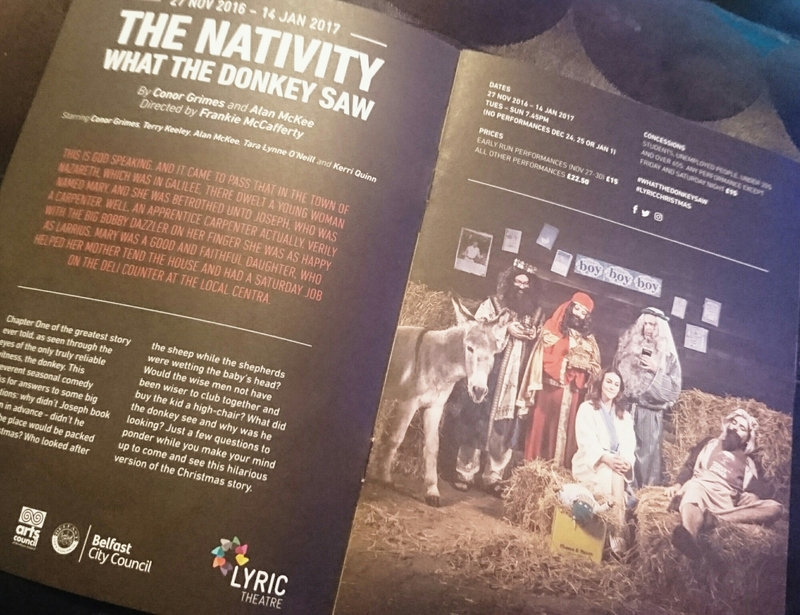 However, I recently decided to set aside my feelings of jealousy to all Nativity performers to check out the latest offering at the Lyric Theatre, Belfast: The Nativity – What The Donkey Saw. My partners in crime for this Lyric adventure were culture buddies Andy and Mark. When we got to the Lyric Theatre, the place was abuzz with people getting into the Christmas spirit. I even spotted a few Christmas jumpers and festive headpieces. As the lights dimmed and the voice of God spoke to the audience (God in this instance being a very feisty and sassy Pamela Ballantine), the tone was set for the rest of the show. In this version of The Nativity, written by comic duo Grimes and McKee, Mary (played by Kerri Quinn) and Joseph (played by Terry Keeley) meet at the local Centra where Mary works at the deli counter. Before Joseph can put a wedding ring on it however, Mary is told by the archangel Gabriel, in a super creative costume, that she is carrying God’s child and so she, and a very understanding Joseph, get their nuptials out of the way before packing up the Hyonki (a budget donkey from Korea) and making the long journey to Bethlemhem to participate in the census called for by Caesar J Trumpius who is insistent on enforcing taxes on all, except himself of course. This is just one of the current cultural references in the script that ensures that The Nativity is bang up to date. The Nativity – What The Donkey Saw is festive entertainment at its finest. The cast of five, which included Conor Grimes, Alan McKee and Tara Lynne O’Neill supporting Quinn and Keeley’s Mary and Joseph in an exquisite array of roles, from angels, shepherds, wise men, carpenters and Roman Centurions, all give stellar performances. As well as each performer showcasing exceptional comic timing, they also all seriously hold their own throughout the play’s numerous musical numbers. The play has adapted a number of well know songs to tell the tale of this modern day Mary and Joseph. ‘When a Child is Born’ for example was one of my stand out moments for me. The lyrics had mums and dads nodding along knowingly whilst the fabulously choreographed routine was a fun parody of any boyband music video ever. From start to finish The Nativity – What The Donkey Saw had me howling with laughter and for a performance that clocked in at over 2 hours, the time just flew by. Whilst Christmas is often a time for the children, it was lovely to attend a performance that is as much for the adults as the kids. This was my first festive outing at the Lyric Theatre, however I enjoyed it so much I think it a new Christmas tradition had been born. The Nativity: What the Donkey Saw runs at the Lyric Theatre until 14 January 2017.